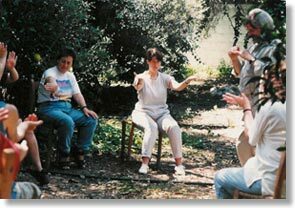 In the summer of 1996, the partners who had put so much work into creating the London Festival and the Hildesheim seminar met for a week of skills exchange and personal development on the island of Crete, by kind permission of our Greek partner, Cleo Mavroudi. [Image: Improvising around memories in Crete]. The team of fourteen from seven countries, included theatre directors, social administrators, health and community workers, all highly creative and imaginative people. 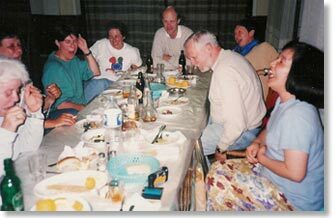 Having time together when we were not responsible for organising large numbers of older people or running a demanding conference event was immensely refreshing and enjoyable and enabled us to consolidate our personal friendships. This has been very important in ensuring that we do not lose contact with one another when we do not happen to be working together on current projects. [Image: Relaxing in Crete].